Bills Window Cleaning is a rapidly growing successful business and to help with this growth we are looking for positive and hardworking people to join our group. We are currently taking registrations of interest from people looking for a fresh start, you may have been in the cleaning industry or be someone that requires a new start, experience in window cleaning is not required. Always wanted to start your own business but have been worried about doing all the hard yards setting it all up and potentially waiting for years for it to become established? We offer you the opportunity to join our group in a chosen area which will allow you to use our brand name, access to preferred suppliers and insurers, marketing and SEO systems, website, branded shirts and invoicing pads, window cleaning starter kit and ongoing assistance to get you started and hit the ground running. You will still need to market your business in your chosen area and we can also assist with this. For a no obligation discussion about this fantastic opportunity please use the registration form below and we will be in contact with you. Alternatively please call Bill on Ph: 0419 223 555 for a confidential discussion. If you are looking for a business with very low start-up costs the upfront fee commencing from $6,990.00 plus GST which includes a starter kit including basic window cleaning kit, company branded shirts, flyers and other marketing material and access to our website for any leads in your territory. This is a fantastic opportunity for anyone that is wanting to start their own business but have been cautious about starting their own business by themselves for an extremely low entry cost. Please register your interest to us stating prior working history etc and if you are considered suitable we will arrange for you to complete a full application form and a meeting will be set up to discuss the opportunity in more detail. To be successful to join our group some of the following attributes are required but not limited to as follows. Friendly customer focused and have a keen eye for attention to detail. Not afraid of hard work. Be able to build a strong customer base in your designated territory by building relationships and conducting local area marketing to attract new customers on an ongoing basis. Work your own hours as per customer demand. Be reliable and have excellent communication skills. Our Managing director has over 30 years successful experience in running and managing both small and large business teams which you can have access to allowing you the expertise and knowledge gained by him. Hands on experience with the window cleaning business. Preferred suppliers on hand to offer ongoing service. Systems in place including website, marketing, google positioning etc. Company branded logo with shirts, sign writing etc. Access to preferred insurance rates. 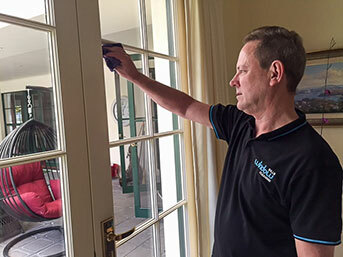 We are one of Adelaide's Professional window cleaning companies providing exceptional service at affordable prices. Our Territory Licenses provide one of the most affordable ways to work in your own business. We provide training, equipment, marketing, branding and ongoing assistance. Why not Call Us for more information on starting a new career in window cleaning. Bill's Window Cleaning is a proud member of the Australian Window Cleaning Federation.